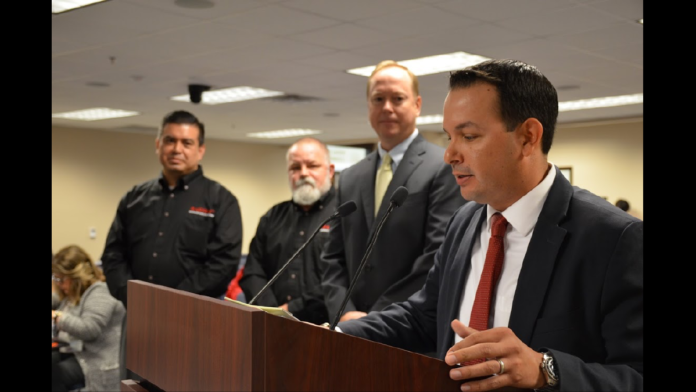 EDINBURG — Hidalgo County has received statewide recognition for its vehicular GPS program, and now other entities want to replicate it. The Texas Association of Counties awarded a Best Practice Award to the Hidalgo County Executive Office Nuisance Abatement program for its global positioning system that has already saved taxpayers more than $25,000. TAC issued three awards to Texas counties for infrastructure and technology initiatives taken in 2016 and featured the winners periodically through its publication, County magazine. Hidalgo County was featured in the latest issue. “The whole idea of a Best Practice Award is to show what’s working in counties and highlight them so that other counties can see and replicate those initiatives,” County Operations Administrator J. Chris Treviño said. Treviño, who oversees the program, said the initiative continues to reduce unnecessary expenditures through its detailed tracking abilities. The system alerts county officials when county employees in 127 units drive above the speed limit, go outside of county lines or spend too much time idling. “We continue to save money on fuel, and we continue to see our speeding violations decrease and our idle violations decrease,” Treviño said. The system, which alerts officials if someone attempts to tamper with it, also serves as a safety and maintenance tool, alerting the county about needed services, such as oil changes and tire rotations. The program’s popularity has grown since the issuance of the award, and others have taken note. At least three governmental entities, including Texas State University and the Webb County Sheriff’s Office, have reached out to Treviño inquiring about the system and its operation. And while Treviño is charged with the day-to-day operations of the program, he was quick to mention other key players.